Update #3: To accommodate the requests, we upped the number of full kits from 10 to infinity! Update #2.1: To accommodate the requests, we upped the number of full kits available from 5 to 10. Update #2: We added another donation level! For $200 you now get everything from the $100 level + stepper motors and a power supply! That's a *full* electronics kit! Update: We are sold out of the $50 Personal Factory making vouchers from Ponoko! Now if you donate $50, your reward will be a $25 voucher. Have a look around the DIY CNC scene and you will notice the lack of simple, low cost, straight forward build options. We want to fix that. For the last four years we have been designing, redesigning, and building what we hope to be a CNC machine that anyone can build for about $300. Did I mention that cost even includes the electronics to run the machine? Unlike other projects where you're shelling out $1,000 for just the frame and maybe motors, shapeOko includes everything you will need to turn your ideas from just a crazy thought into a tangible item. What makes this different? One of the frustrations we had with other designs was the fact that you had to visit a lot of different vendors in order to get all the pieces. We didn't like that. Plus, some projects didn't have a central "released" build, which made it difficult to determine if what you were building was actually what you were expecting to build. All of that resulted in a design process built using constraints: 1 standard design with a $300 total cost using a maximum of 3 vendors. So far, our constraints have treated us well. We are close to the $300 goal and as of right now, thanks to Ponoko's Personal Factory, we are hoping to only need to visit 2 vendors: Ponoko and your local hardware store. What's the goal? We are not looking for funding to make a bulk purchase, build kits and then sell them back to you at marked up prices. Nor are we trying to raise money to buy our own laser cutter. That's not really our style. Instead, our goal is to finish the design, make it repeatable, and then freely distribute it under an open source license for everyone to enjoy. So what's the money for? In order to complete the project and make it repeatable, we need to purchase new materials, pay for laser cutting time, test 3 new designs, and tidy up the final iteration. The funding will also allow us to explore alternative designs which could drive the final build cost even lower than the $300 goal. More Details: Right now we have 3 designs that we will be building. All of them are a typical moving gantry style 3 axis machine, with a target size of around 12x12x8 inches intended to be used with a small spindle or dremel style rotary tool. However, each uses a different set of rails, components, and all have slightly different linear motion designs. One of those designs will end up being shapeoko v1. All of those design notes and experiences will be available. As a side note: One of the designs will be incorporating the result of a fellow kickstarter project, and recent success story: MakerSlide! What about over funding? We will continue to refine the product, and if possible, purchase several full parts orders to sell as a complete package at cost back to the community who funded us. With donors having first dibs on the overfunding funded kits. Think of this project as a CNC machine designed for the everyday person. A CNC machine designed for the community! 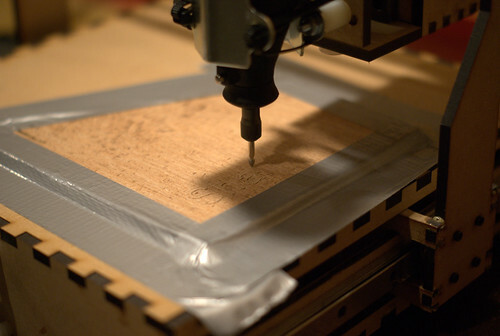 A CNC machine designed to expose as many people as possible to the power of making things! A CNC machine that is both simple enough for anyone to use yet powerful enough to use for real work. A CNC machine you can love? Well, at least a CNC machine that wont break the bank.